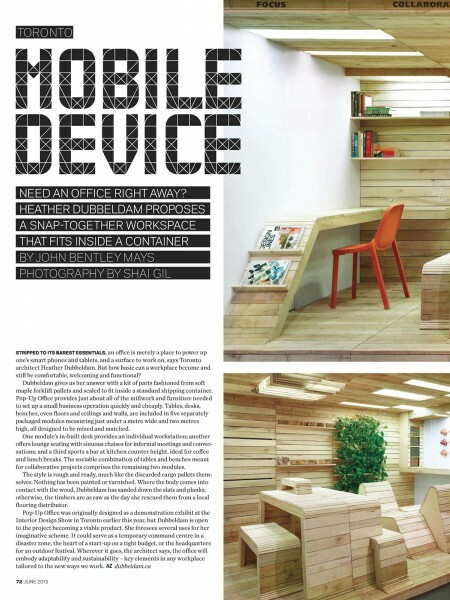 The Azure offices issue focuses on 'the new office,' and DA+D is excited that the POP-UP office is included, featured in an article by John Bentley Mays! The POP-UP Office is an installation that explores the evolving way in which we work. Using modular units that can be combined in different ways, the result is a workspace that is simultaneously bare bones and tailored to the individual. Built out of reclaimed wood pallet boards and their frames, separate modules collectively form the modern work place facilitating both individual work and collaboration — a workspace, collaborative space, lounge area and refueling station.